Some time ago, we posted a blog about marking up your bookmarks and pages using Markdown. That blog covered the basics, such as making text bold and using a fixed width font. In this second blog, we will continue to explore the possibilities of Markdown. We will show you how you can make use markup to enhance your pages with bulleted lists and headings. It turns out, most people are very lazy when it comes to reading text from a screen. That’s not necessarily a bad thing. There is just a lot of information people have to process every day and being lazy helps to keep things manageable. So people read what they need to read and will hardly ever finish an article. To make sure important information is not missed, using proper markup is essential. And it turns out bulleted lists are a very effective reading aid. Using Markdown, it is really simple to create bulleted lists. A good example of a place where bulleted lists work well is in the Notes widget. But bulleted lists will work in bookmark block headers and bookmark descriptions as well. So feel free to experiment! 3. He does it, too! 4. I will squeeze you! 5. You like me, right? One interesting thing to note: the Markdown processor will automatically number your items. So even though it will look nicer if you start with 1 and continue the series, that’s not really necessary. If you would start every line with 1, Markdown still recognizes the list and will automatically number your items. 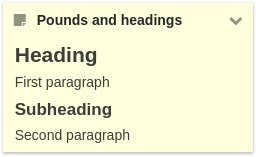 Another formatting technique that helps to make long texts more readable is the subheading. Subheadings add structure to text. And because subheadings are usually set in a larger font, they are easily recognized. When reading a text, people tend to scan its headings and bulleted lists first. Knowing this, you can help yourself and others navigate the texts in your notes widgets easier. The second way to achieve headings is more elaborate but looks ‘nicer’ in the actual Markdown source code. That is why some people prefer this style. And with good reason: Markdown was originally conceived as a markup language that would be both easy to read by users and machines. That’s why most of the markup is really intuitive. Please note that, even though it looks nice, you don’t have to use the exact same number of dashes as there are characters in the heading. It is sufficient to use two dashes (or equality signs). Using these more advanced formatting techiques, you can make the texts in your notes widgets more legible. They work for bookmark block headers and bookmark description as well. Give it a try. Experiment a little and let us know if you have any questions. Soon, we will continue this series with a blog of more advanced formatting options, including inserting hyperlinks and images.